The Attain program will combine members' health record data with activity tracking to offer personalized goals, with rewards that include the Apple Watch itself. This morning Aetna (which was recently acquired by CVS) and Apple announced a new wellness program that will leverage health data, a custom app and the Apple Watch. 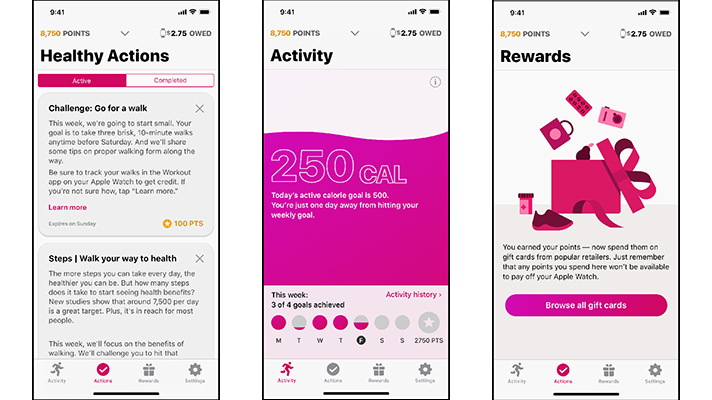 Called Attain by Aetna, the voluntary program will deliver personalized health goals, recommendations and rewards based on members’ daily activity. Upon enrolling and launching the Attain app, members will receive general healthy action notifications based on daily activity, or on information included in their Aetna health record. These could include reminders to meet activity goals, get a flu shot, refill a prescription or visit a primary care physician for a checkup, but may also come as a notification of low-cost options for lab tests or imaging. Over time, the program will further refine its recommendations based on the individual. Meeting these goals and challenges will earn rewards points that members can spend on gift cards, or redeem to offset the cost of the Apple Watch itself. The Attain app is set to launch in the App Store this spring, and will be available to Aetna members with an iPhone 5S or later as well as an Apple Watch. Participating members will also have the option of sharing their data with Apple, which the companies said will be used to improve the program’s algorithm and eventually lead to more targeted recommendations. Wearable-aided wellness plans have taken many forms and included many devices, but there’s evidence to suggest that those offering Apple’s smartwatch are especially effective. The Cupertino company’s wearables are currently leading the smartwatch market, so it likely isn’t a stretch to say that a sizable portion of Aetna’s member pool will already meet the program’s device requirement at launch. On a wider scale the new program is yet another signal of Apple’s continued push into healthcare, and specifically its continued efforts to play a major role in the payer and employer wellness market — an area in which its direct competitor, Fitbit, has also very publicly placed its bets. Aetna and Apple have been hand in hand since 2016, when the payer first began offering Apple Watches to some of its large employers, individual members and 50,000 of its own employees. More recently, UnitedHealthcare announced in November that its incentive wellness program, Motion, would begin supporting the Apple Watch, and word on the street is that Apple has also been chatting with private Medicare plans about bringing the devices to at-risk seniors.